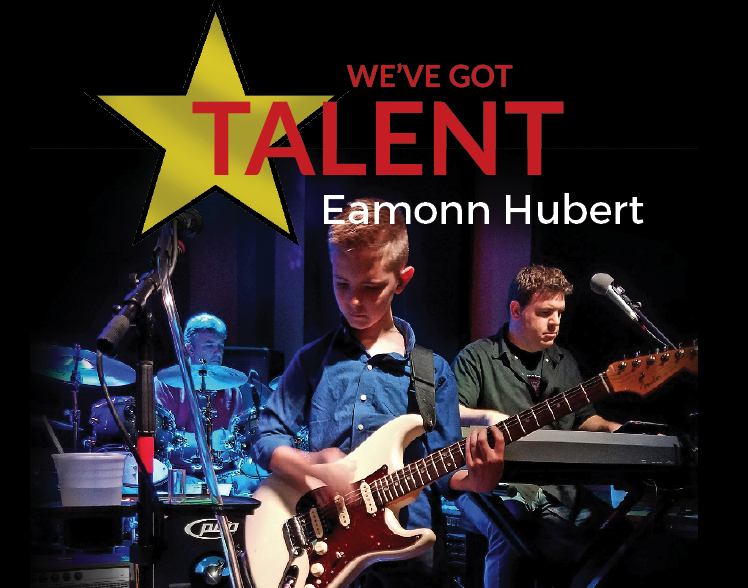 Eamonn Hubert is a young musician from Endicott who defines talent. As an accomplished guitarist with a natural ability and perfect pitch, he has performed at numerous venues including Food Fusion Bar & Grill in Endicott, auditioned in NYC for Broadway’s School of Rock twice by invitation and has won second place in a scholarship competition for musicians under 18 at the New York State Blues Festival. And he has done all this amazingly before the age of 10. Eamonn’s favorite music genres are blues and classic rock, everything from America to the Eagles and including Stevie Ray Vaughan, Michael Jackson and Guns & Roses. His tastes in music is varied, but his abilities remain consistently strong. When Eamonn is performing he is relaxed and focused. This is important because Eamonn has ADHD and general Autism Spectrum Disorder. Eamonn’s mom Jimae says he didn’t speak until he was 2 1/2 and “music was an early way of communicating.” Eamonn is said to love the crowd’s response when he plays. He knows that what he does makes a lot of people happy as they regularly tell him. Although Eamonn is someone who plans to make music or acting his profession, he is not ruling out becoming a doctor to help kids with psychological problems. And key in his life…. is being able to afford donating to help others in need.